3 years prior to the first GPS Block IIR satellite being launched, Microcosm carried out a study for the GPS program office at Los Angeles Air Force Base called “GPS Utility Analysis and System Acquisition Inputs. The scope of this activity included a review of the GPS system specification, acquisition plan, and mission objectives with the principal goal of determining how to achieve substantial cost reductions in the acquisition of the GPS follow-on. The principal conclusion of that study was that the goal of the GPS system should be to deliver an appropriate navigation signal at the surface of the Earth with the specified availability, integrity, and survivability at the lowest possible cost. Changes in the system are possible that should permit significantly reduced annual cost. Microcosm continues to pursue options for creating a more reliable, lower cost GPS system architecture that will serve the evolving needs of the warfighter well into the 21st century. 1 Wertz, J. R., Microcosm Inc., “Coverage, Responsiveness, and Accessibility for Various ‘Responsive Orbits’,” 3rd AIAA Responsive Space Conference, Los Angeles, CA. Apr. 25–28, 2005. 2 Wertz, J.R., N. Sarzi-Amade, A. Shao, C. Taylor, and R. Van Allen, Microcosm Inc., “Moderately Elliptical Very Low Orbits (MEVLOs) as a Long-Term Solution to Orbital Debris,” AIAA/USU Conference on Small Satellites Logan, UT. Aug. 13–16, 2012. 3 Wertz, James R., Hans Meissinger, Lauri K. Newman, Geoffrey N. Smit, Mission Geometry: Orbit and Constellation Design and Management, Microcosm Press, Segundo, CA 2001, 934 p.
NanoEye and its several variants, including SpaceHawk, MicroEye (Fig. 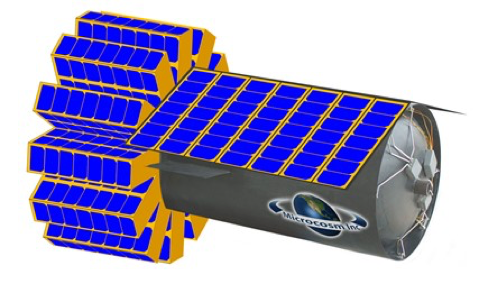 1), and the CubeSat Delivery Vehicle (CDV) shown in Fig. 2, support a wide range of military and commercial missions. All of these vehicles have several km/sec of maneuvering delta-V that enable significant orbit agility far beyond the capabilities of any typical COTS spacecraft of comparable mass. Further, all of the spacecraft incorporate Microcosm’s all-composite unibody structure with mostly space-qualified CubeSat bus components. In addition, NanoEye, SpaceHawk, and MicroEye all have rapid scanning capability, again far in excess of any known spacecraft, that enable on the order of 1,000 images to be taken during a single pass, with no target optimization required. Finally, all versions of the spacecraft utilize Autonomous Orbit Control (AOC) that enables precision advance mission planning, of particular importance for all but the CDV when constellations are involved because there is no need for ground control of the orbit of each spacecraft. A preliminary design associated with a variant that has a synthetic aperture radar (SAR) payload has been completed. In addition, evaluations have been completed that would support a LIDAR payload. Whereas the benefit of low altitude operations is 1:1 for passive payloads (still quite a good impact), for active payloads the benefit varies approximately between ~1:R3 and ~1:R4, which represents a huge advantage relative to the being able to reduce mass, volume, and especially power for the host satellite. 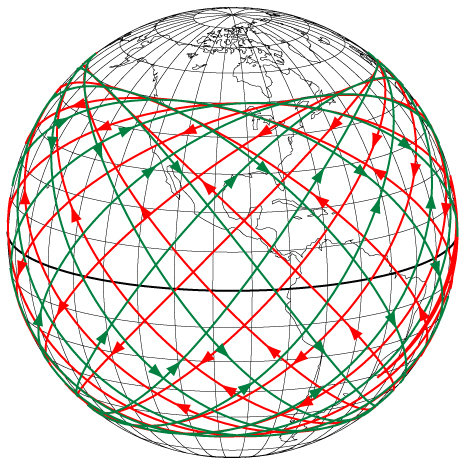 Regarding passive payloads, if 1 m optics is required at 800 km, only 0.25 m optics would be required at 200 km. For an active payload that requires 2,560 watts at 800 km altitude, only 40 watts (1:R3) or 10 watts (1:R4) would be required at 200 km altitude. Combining an electro-optical (EO) and infrared (IR) payload on one spacecraft with a SAR payload on a spacecraft flying in tandem with the EO/IR spacecraft will provide day/night/all weather surveillance capability. 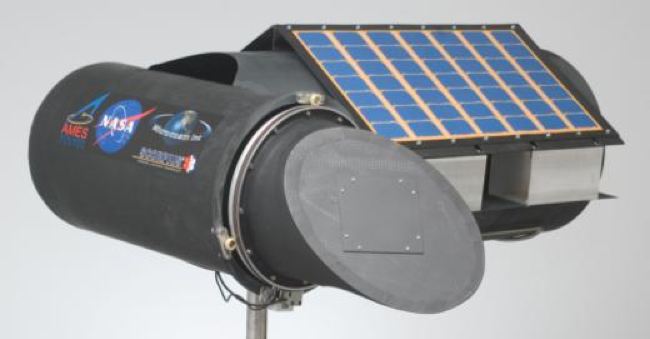 The original NanoEye spacecraft was developed to support tactical surveillance for the Army and incorporates EO and IR sensors that enable day and night imaging. SpaceHawk is capable of detecting and tracking hypersonic vehicles utilizing a larger aperture telescope than the telescope in NanoEye. MicroEye looks similar to the SpaceHawk vehicle, and currently incorporates the same telescope used in the NanoEye spacecraft, but focuses on debris tracking and space situational awareness (SSA) missions. The CDV can deliver up to 12 3U or 6U CubeSats to various orbits. There is one other factor that Microcosm leverages in terms of broadening the missions that its spacecraft can support, namely repeat coverage orbits. 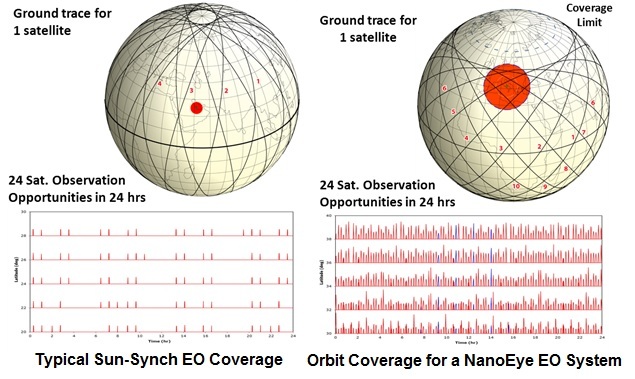 Rather than place spacecraft in sun-synchronous orbits that provide coverage of some area of interest every 2-3 days, repeat coverage orbits involve placing the spacecraft at inclinations several degrees above the latitude of interest. The result is one spacecraft will pass over the area of interest every 90 minutes 5-6 times per day, so that three spacecraft in three planes 120 degrees apart will cover the area of interest every 90 minutes 24/7. The government has funded independent simulations of constellations incorporating Microcosm’s NanoEye bus and EO, EO/IR and SAR payloads. The results demonstrated significant contributions from its low-cost constellations. The results can be provided upon request to those with the appropriate security accesses.